Tusk handguards protect your hands from roost and brush. 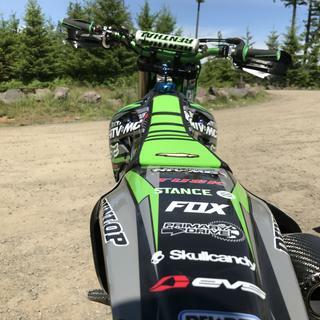 Handguards can be positioned independently from levers. Tusk hand shields are made from durable, injection molded plastic and are replaceable. Clamps are made from lightweight 6061 aluminum with a T6 heat treatment for added strength. Clamps fit 7/8" and 1 1/8" bars. Shields, clamps and all necessary hardware included. Both ATV and MC handguard applications. Not bad for a cheaper handguard. Pretty stiff. Great for the kid bike. Boys haven't broke them yet. Tuff for a single mount style. An amazing product for an out standing price another home run from tusk. Tusk handguards protect your hands from roost and brush small tree limbs. Dropped the bike once and it just bent and didn’t break. Pretty flexible plastic guards, and sturdy mounts. Worth the money. This is a really great product. The best quality and value are top notch... but it didn't fit my 2017 CRF250L like advertised. In fact, it was way off. 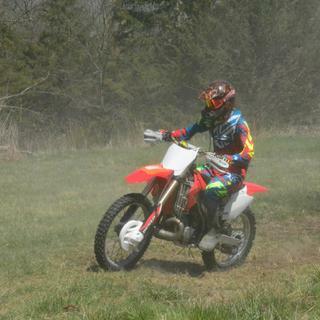 I didn't return the hand guards because it was so cheap lol. If you find out this hand guards fits your bike, order away! Purchased the wrap around style, but didn't feel like cutting into my throttle tube. Ordered these and they installed quickly and protect well enough from branches and cacti. Purchased these for my Son's 2018 Oset 12.5. 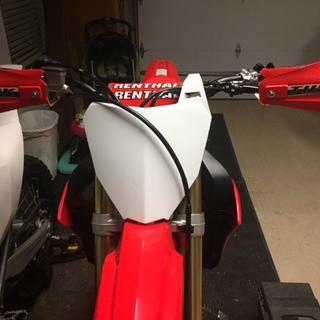 The hand Guards do fit the Oset but they stick out past the end of the bars an inch or two which I figured they would. Purchased them mainly because I though they would look cool and possibly protect the levers. But I did noticed that when he is riding through the desert he is only about as tall as the big sage brush and bushes and the hand guards were doing their job by protecting his hands from the tall sage brush and bushes. Awesome product well made and engineered. Would recommend for a full size bike also. 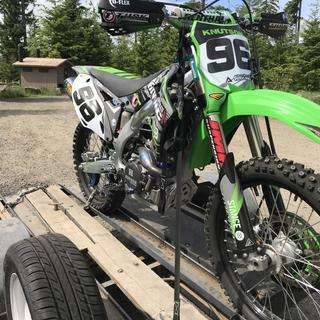 Nice handguards. Needed to grind a relief in bracket to clear wiring harness from controls to fit properly. With a little fitting they are fine. A little tricky to install on brake lever side. They look good and the price was fair. I just can't tell you too much yet as they are a new install and you want feedback now. Awesome gaurds for an amazing price! Great gaurds. A little bigger than I thought they were in the picture, but hey more protection right! These look great and block wind as they should. These hand guards are great for the price, easy install and seem to hold up fairly well so far. have had for almost a yr. now and have not broken on me yet. although have not taken any big spills. They are a little flimsy, however maybe they are suppose to be that way so they give instead of break. All in all I think I made a good purchase. Not too expensive, and they get the job done as expected. They will bend when you drop the bike at any rate of speed, but they aren't reinforced so to be expected. Perform well for what they're marketed for. First ride in the woods and melted like butter. Very low speed layover and went to pick up the bike...right guard was later almost all the way over. Tusk brand is always great quality. Recommend these! This is a very affordable, very tough set of hand guards. I am not a fan of the wrap around type, but I want to keep the weeds and branches off my knuckles. these do the job better than some more expensive ones I have had. These have dedicated mounts and can be adjusted to almost any position independent of the levers, something you can't do with the type that mount on the lever pivots. Replacement parts are available which is also nice. The logo is a bit dorky, but overall, a great product. Plastic and aluminum are not ideal together. Drop your bike once and the plastic gaurds are ready for replacement. Attractive, protective product for track guys who only need protection from roost. Fit great and look good. Installed on our '08 CRF150F and '08 TTR 230. All the protection I need for trail riding. Have survived tip-overs just fine. Put these on my wifes Yamaha TW200 and they keep the bugs from hitting her hands. Must have, inexpensive and they do the job. I aim for branches now, knowing they will not be knuckle busters. These Handgaurds are an easy to install and protect from rocks and brush, but they aren't perfect. Fit is a little off but overall I like them. Big hand guards but the plastic is thick and looks durable. They are just a little oversized. If youre tight on loot and NEED hand guards these are the ones to get. I bought these cheaper handguards for the price because I didn't know if I would like them or not. I do like them and for the price you cant beat them. I have crashed several times and they are holding up really good. these are very nice looking they are easy to put on and they will go on just about everything. the plastic feels tough and no vibration at all they are very stable and i would reccomend these for the price they are!!!! I bought these thinking they were an incredible deal for full aluminum bark buster type handguards. I was wrong, but the quality and design for a roost / wind guard is great. The pictures were hard to determine exactly what I was getting and that is why I am posting a review. 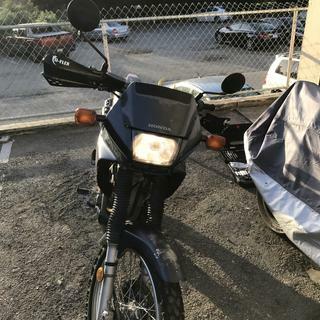 The aluminum part is just a stand off from the handlebar for the plastic guard to attach to, there is no aluminum protecting your hands, so I returned them in favor of a future purchase of barkbuster or cycra handguards. Good luck! You need to washer the bolts front and back. The metal is very weak and bends in very small impacts. Have held up great over a racing season. bolted up nice. good setup for the money. Changed from my last set. I bought a set of these a few years ago and the matched the color of my blue Twin Peaks. So I bought another set for my CanAm...first off the yellow doesn't match the CanAm yellow but that's not the issue. 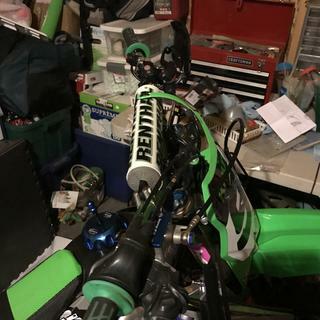 The issue is the metal connector is about an inch or more shorter that the previous set so it won't clear the brake lever, it's pretty much worthless to me at this point so it will sit in the cupboard and collect dust unless I find a kids atv for them to fit on. I liked the first set the second set made changes for the worse. Great handguards, they were on sale, great buy, perfect for what i wanted which is just roost deflection, fitted the white MX model to my white YFZ450R atv, they fit perfectly & look like a factory fitted item, very happy. Fast shipping, great product for price! a must have for all types of riding ! Does it come for both sides or one? BEST ANSWER: This comes with both the left and right handguards. Will these fit a honda 250 4 ~wheeler ? Yes I think they would fit fine. I have them on a Yamaha YZ250F and they work great at keeping the mud off my hands and protecting my hands from rocks. I put them on a Suzuki LTR 450 and they fit fine, as long as you have 7/8"dia bars you should be fine. Yes they will. 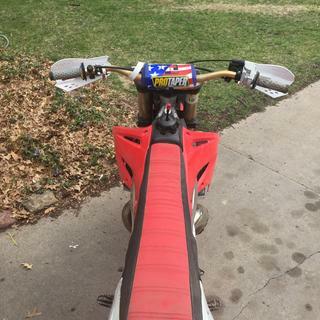 I have them on my Suzuki 400, Honda 300 and Honda 250...great Handguards…. BEST ANSWER: They fit my 1990 blaster fine but the 2004 has hydraulic front brakes. After looking at my yz125 with the hydraulic Master cylinder I believe they would fit fine. They should work. They're a universal fit. I have them on both of my Yamaha raptor 250s and several dirt bikes. 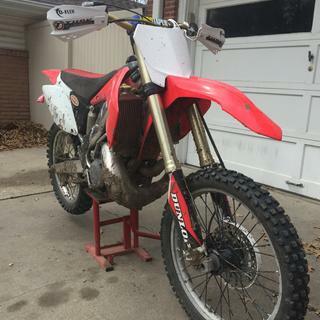 Do they have a small size for the Honda crf50? They are one size fits all. They are very well made and have saved my hands from plenty of roost. I have them on both of my dirt bikes & ice racing quad. They do fit 7/8 bars. The hardware kit I got with mine the threads wouldn’t take the bolts never had these problems with these Guards , how can I go about fixing it ? BEST ANSWER: I never had this problem, maybe take the hardware to a hardware store and find a bolt that would work or return for new set. Which bolts? The clamp to the handle bar? Or guards to braces? 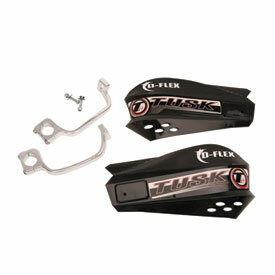 Will these hand guards fit on a Yamaha ttr 125? BEST ANSWER: They should if you have 7/8 handlebars but I would recommend putting full bark busters on as these won't hold up for any woods riding. I put the tusk full wrap around on my KX125 and put Moose on my CR250 and the tusk have held up. Good luck. Yes they will. you will have to maybe adjust the position of the brake and clutch lever like you would with any handguard. thank you for your question. What is the difference between the MX D MC, Vs. The MX D ATV Flex Guards if any? Both item descriptions seem to indicate that they are a universal fit for both MC or ATV applications. Thank you. BEST ANSWER: The metal mounts that attach to the handlebars are a little bit different between the ATV model and the MC model. The ATV mounts push the guard out a little further to accommodate the extra controls sometimes found on ATV's. Will these work with the tusk t-10 7/8s bars ? BEST ANSWER: Yes they will, i have them on a stock set of 7/8 bars.